While the composition of the pools has not yet been drawn, all 6 teams who will be taking part in the Third Round have been determined. Poland was the big winner of the day. They needed to get a result against Serbia, and they delivered a 3-0 sweep. France beat Argentina, but they finished 3rd place in Pool H and have been eliminated. Italy defeated the Netherlands 3-1 in Pool E, but that outcome did not have any effect on the teams who qualified for the next stage of the tournament. Russia made quick work of Finland, and they are moving onto the Third Round as the top runner-up. The United States earned a 3-0 sweep over Iran using their second string. Canada moved into 2nd place in Pool G with a 3-2 victory over Bulgaria. Belgium gave Brazil all they could handle, but the 2016 Olympic Champions prevailed in a tie-break. Australia pulled off an upset over Slovenia in a tie-break, but they still finished at the bottom of Pool F.
This was not the most exciting match, but it was the most important match of the day. After France downed Argentina, Poland needed to get a win over 6-1 Serbia in order to book their ticket to the Third Round in Turin, Italy. Poland jumped out early and kept their foot on the gas pedal in an emphatic 3-0 sweep over Serbia. While Serbia gave their starters a rest (they had already clinched a spot in the Third Round), they did not pull them from the match until partway through the 2nd set. Poland needed a positive result from this match to continue on in the tournament, and they got it behind a 21-point performance from Bartosz Kurek. The starting opposite put away 14 kills in addition to his 2 blocks, and a match-high 5 service aces. Artur Szalpuk continued his exemplary tournament with 15 points on 10 kills and 4 aces. Micah Kubiak posted 11 points on 8 kills, 2 blocks, and 1 service ace. Jakub Kochanowski led the match with 4 blocks. He also chipped in 2 kills on 3 swings. Poland finished with a 10 to 1 advantage in service aces. Fabian Drzyzga set Poland to a 56.3% success rate in attack. That lone service ace for Serbia came from Aleksandar Atanasijevic. The starting opposite added 4 kills to finish with 5 total points. He was replaced in the 2nd set by Drazen Luburic, who finished with a team-high tying 6 points on 5 kills and 1 block. 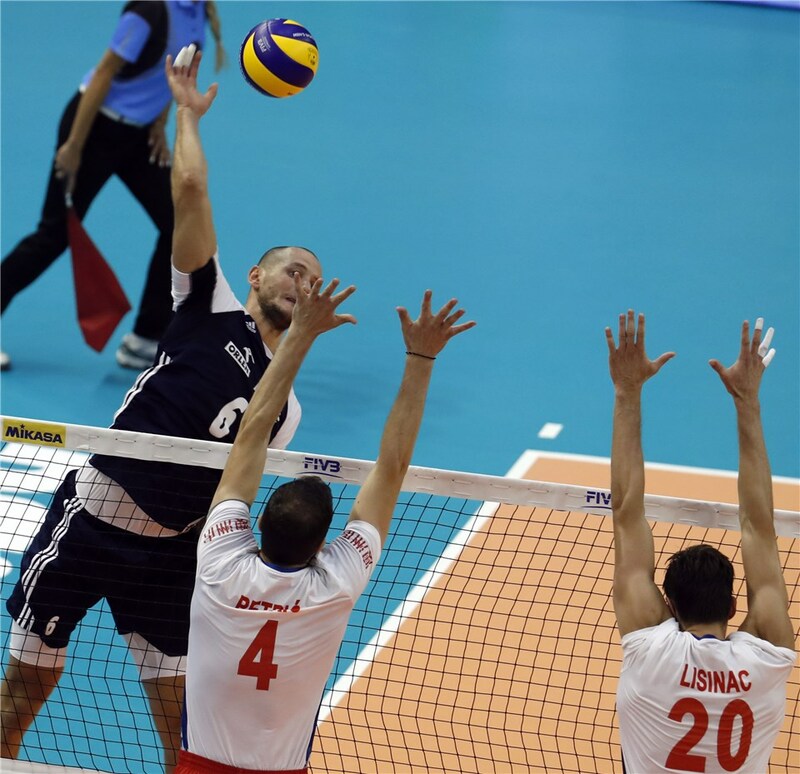 Marko Ivovic also scored 6 points for Serbia from 5 kills and a block. As with the rest of the Serbian starting lineup, he was replaced in the 2nd set. Marko Podrascanin and Srecko Lisinac both scored 5 points from the middle. While he did not produce the best numbers, he produced the best in the most high-stakes match of the day. Kurek’s 21 points from the right side paced Poland on the road to Round 3. His 14 kills on 23 attempts led to a 60.95% hitting percentage. He also kept the pressure on Serbia from the service line with a match-high 5 aces. With 14 service attempts, 35.7% of his service attempts resulted in an ace. He also contributed 2 blocks in the victory.